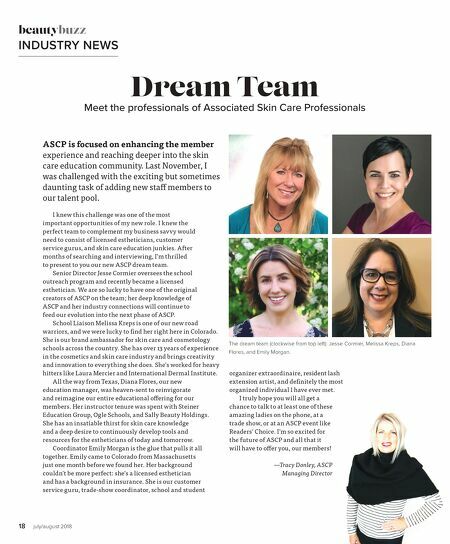 18 july/august 2018 beautybuzz INDUSTRY NEWS Dream Team Meet the professionals of Associated Skin Care Professionals ASCP is focused on enhancing the member experience and reaching deeper into the skin care education community. Last November, I was challenged with the exciting but sometimes daunting task of adding new staff members to our talent pool. I knew this challenge was one of the most important opportunities of my new role. I knew the perfect team to complement my business savvy would need to consist of licensed estheticians, customer service gurus, and skin care education junkies. After months of searching and interviewing, I'm thrilled to present to you our new ASCP dream team. Senior Director Jesse Cormier oversees the school outreach program and recently became a licensed esthetician. We are so lucky to have one of the original creators of ASCP on the team; her deep knowledge of ASCP and her industry connections will continue to feed our evolution into the next phase of ASCP. School Liaison Melissa Kreps is one of our new road warriors, and we were lucky to find her right here in Colorado. 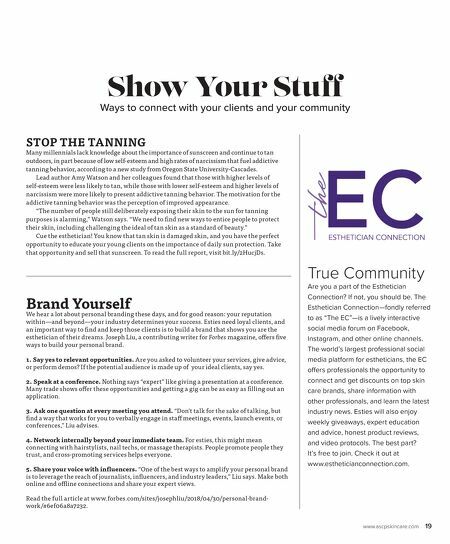 She is our brand ambassador for skin care and cosmetology schools across the country. She has over 13 years of experience in the cosmetics and skin care industry and brings creativity and innovation to everything she does. She's worked for heavy hitters like Laura Mercier and International Dermal Institute. All the way from Texas, Diana Flores, our new education manager, was heaven-sent to reinvigorate and reimagine our entire educational offering for our members. Her instructor tenure was spent with Steiner Education Group, Ogle Schools, and Sally Beauty Holdings. She has an insatiable thirst for skin care knowledge and a deep desire to continuously develop tools and resources for the estheticians of today and tomorrow. Coordinator Emily Morgan is the glue that pulls it all together. Emily came to Colorado from Massachusetts just one month before we found her. Her background couldn't be more perfect: she's a licensed esthetician and has a background in insurance. She is our customer service guru, trade-show coordinator, school and student organizer extraordinaire, resident lash extension artist, and definitely the most organized individual I have ever met. I truly hope you will all get a chance to talk to at least one of these amazing ladies on the phone, at a trade show, or at an ASCP event like Readers' Choice. I'm so excited for the future of ASCP and all that it will have to offer you, our members! —Tracy Donley, ASCP Managing Director The dream team (clockwise from top left): Jesse Cormier, Melissa Kreps, Diana Flores, and Emily Morgan.